Societal change is an irresistible force, shaping our world through the evolution of social movements, technology, economics and politics. Unfortunately, change doesn’t always happen in the right kind of ways, humanitarian and political crises continue to happen, but there are pockets of progress, nourishing our feelings (and realities) of hope. I remain passionate to contribute to the right kind of change. As many of you know, I apply my theory of change professionally through the lens of communications. Over the years I dare to say, I have tried harder and harder to make communications, as a function, a lever for change. My recent blog posts on purpose driven communications reinforce this. I will stay at it, will keep on evolving my thoughts – with your input please – and grow ideas that contribute to this. Real change requires collective action, collaboration. I look forward to continuing this by working with others. And I hope that we will succeed. Over the last two years, my role with the International Water Association (IWA) has added water, as a leverage point for sustainable change, to my personal focus as an agent of change. Wise water management to satisfy the needs of human activities and ecosystems is a goal in itself, but global water challenges are often part of the root causes of what is not right (and sometimes plain evil) in other areas of life. Conversely, finding the right water solutions can act as a catalyst for systemic change in other areas: health, education, environmental and economic sustainability. The IWA’s current Strategic Plan has created an opportunity for the organisation to evolve and to have greater impact delivering sustainable development. 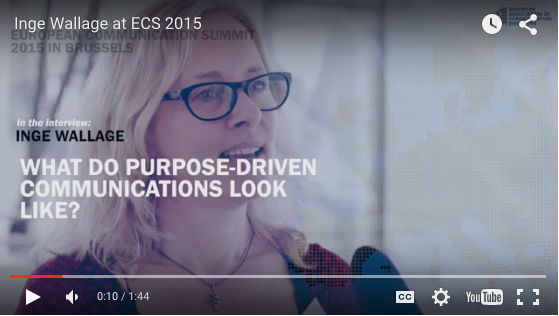 At the recent Communications Summit organised by the European Association of Communications Directors, I was interviewed on these topics. I’m really glad how it turned out. It’s a short clip, which I hope you can take the time to watch and to give me some comments on. Let’s journey together please, and join the quest to change the world for better, for all.